The One Thousand Museum skyscraper is located in the city's Downtown district in front of Museum Park, close to Herzog & de Meuron's Pérez Art Museum and Grimshaw's yet-to-complete Patricia and Phillip Frost Museum of Science. 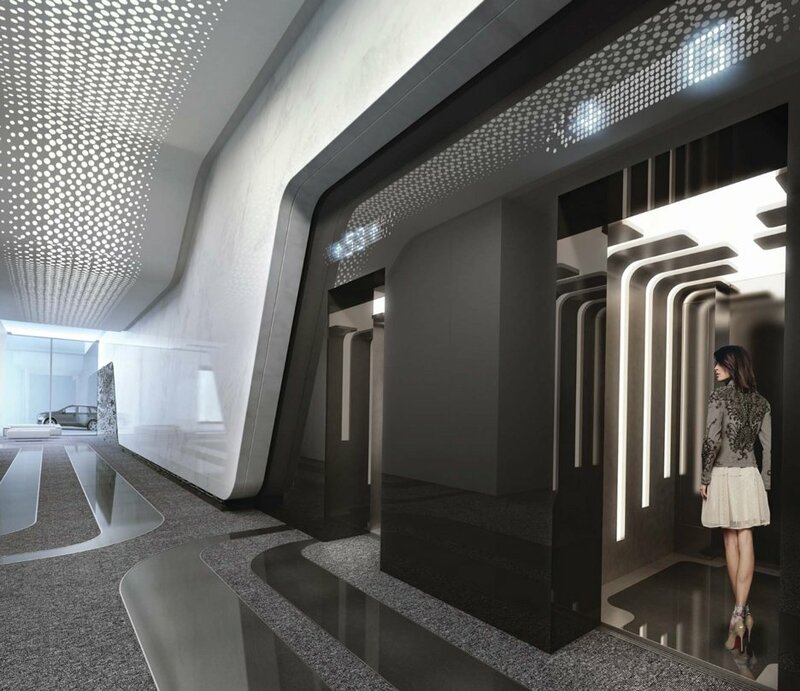 The tower's podium will house a lobby and restaurants, with car parking above. Currently built up to the 11th floor, the tower will eventually reach 62 storeys and measure 700 feet (210 metres) tall once completed in 2018. 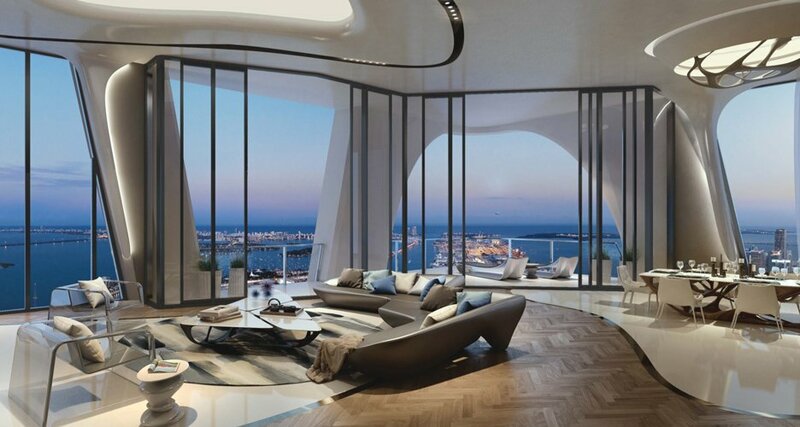 Full-floor penthouses will occupy the top floors of the skyscraper. It features a structural "exoskeleton" that curves up the sides of the recessed glass facades, enabling floor plates to remain largely free of internal columns. 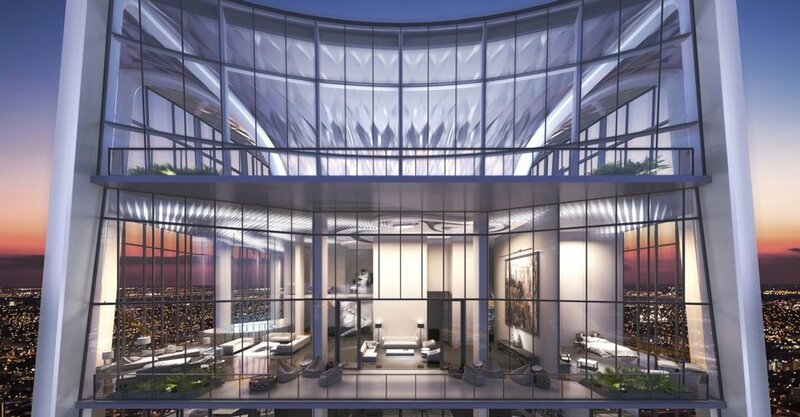 A duplex penthouse will encompass the 58th and 59th levels. Hadid, who died suddenly in March 2016 while in Miami, also created the interiors for the communal spaces of the building. 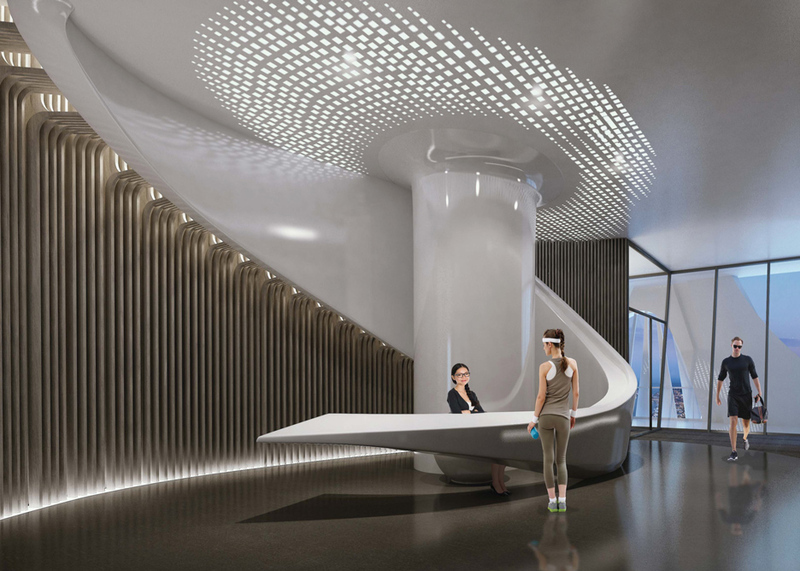 Her signature angular walls and curved surfaces will feature throughout the reception and spa area. The podium from levels one to seven will include a lobby, restaurants and event spaces at street levels, car parking above, and will be topped with a swimming pool deck at the back. This section will be surrounded by gill-like louvres between the sculptural structure to conceal the vehicles. Levels 10 to 14 will comprise townhouse-style properties. 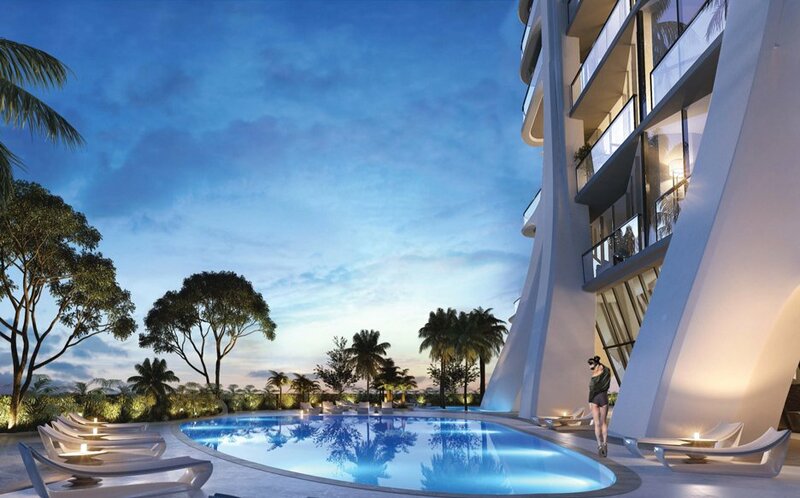 Half-floor apartments will take up storeys 15 to 49, then full-level penthouses will occupy the next eight levels and a duplex penthouse will be located at floors 58 and 59. Each of these residences will feature slightly different balcony spaces and framed views, created by changes in the external structural elements as they snake up the facades. 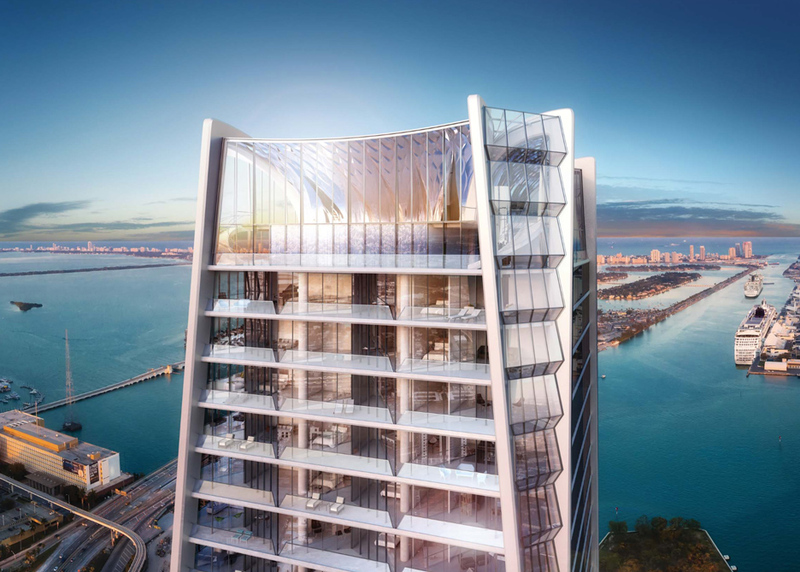 "As the tower rises, the exoskeleton becomes the singular element tracing the unique shapes of oversized terraces that create multiple outdoor rooms for every residence," said developers Gregg Covin and Louis Birdman. 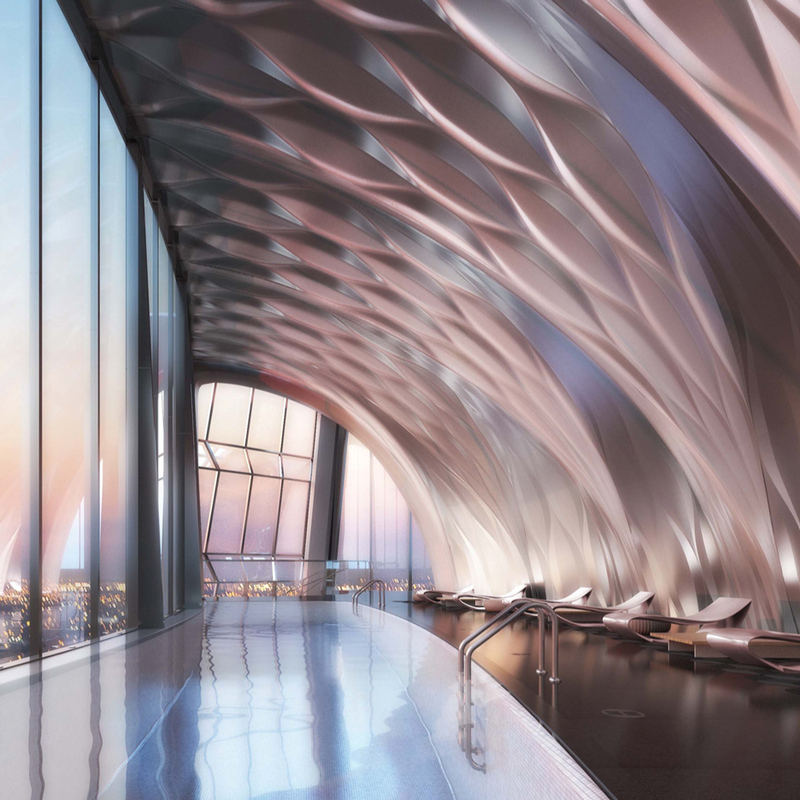 The top of the skyscraper will offer a double-height Aquatic Center and Sky Lounge, complete with an infinity pool overlooking Miami harbour. 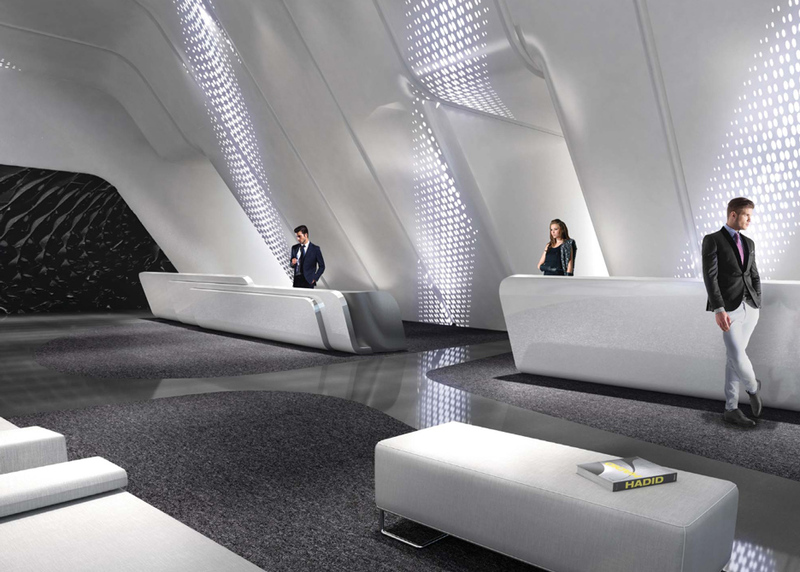 For this space, Hadid designed a faceted metallic wall sculpture that will extend up to the ceiling on all four sides. The metal is intended to reflect the water in the swimming pool and form a "jewel-like" beacon beneath the helipad on the roof. 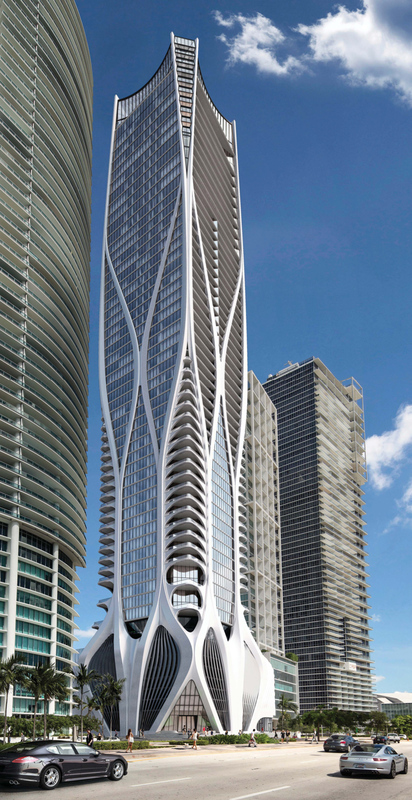 Although she was based in London, Hadid spent much of her time in Miami, which has recently seen a boom in major contemporary architecture projects. Her other project proposed for the area, a spiralling car park in nearby Miami Beach, was rejected by city officials just weeks after her death. 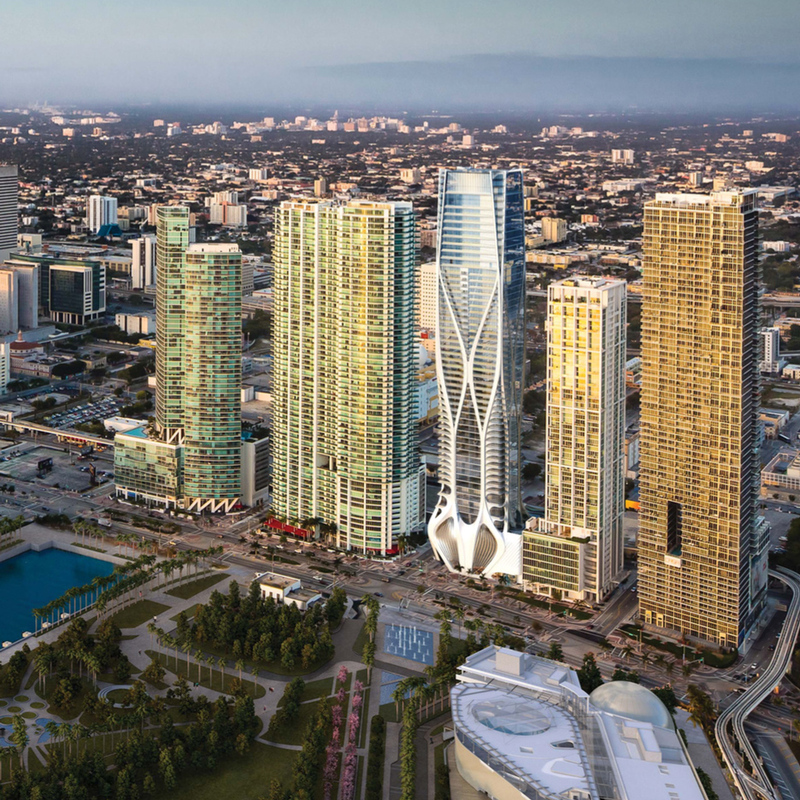 However, Miami developer Craig Robins urged the local community to push for the construction of Hadid's parking garage during a speech at Maison&Objet America's Designer of the Year award ceremony earlier this week. 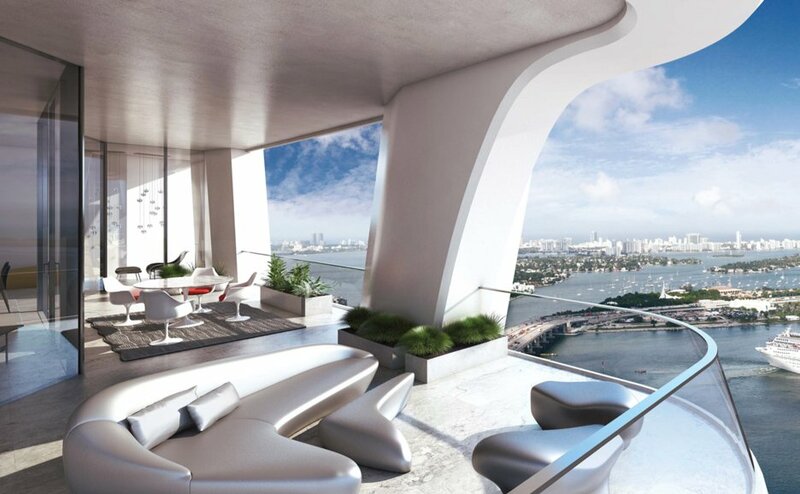 One Thousand Museum also boats a helicopter pad on its roof "[Zaha] has designed an incredible garage in Miami Beach, which is in question now," said Robins. "But we should lobby to resurrect it. 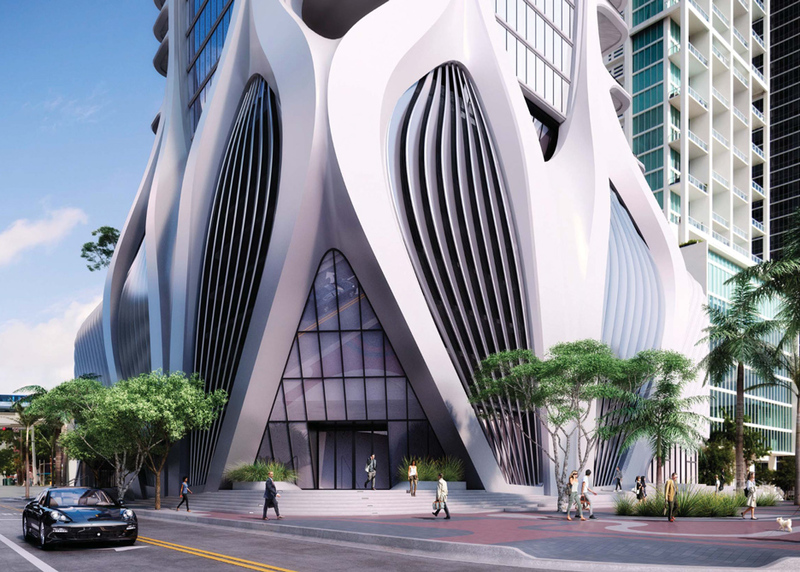 For Miami Beach not to have a Zaha Hadid garage would be sad." 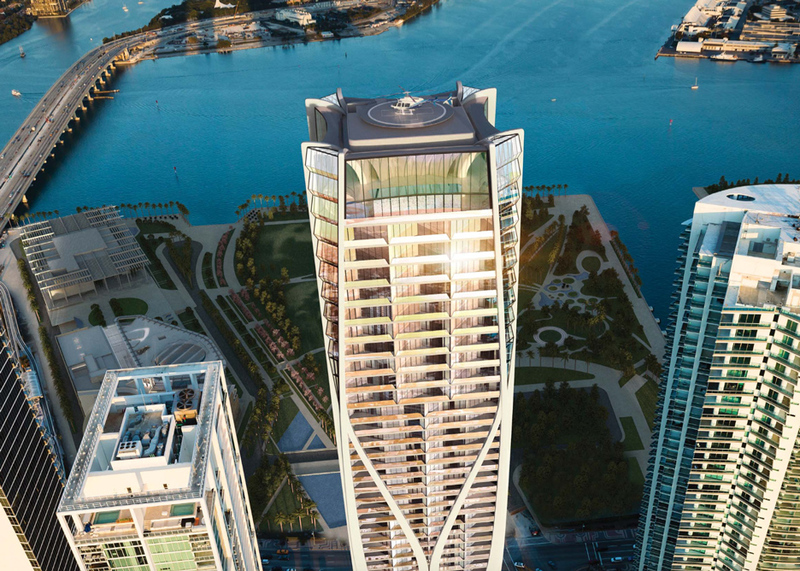 Located beside Miami's museum park, the skyscraper is due to complete in 2018. Zaha Hadid Architects has vowed to carry on without its founder following her death. Since March 2016, the firm has completed a maritime terminal in Salerno, won a competition for a building at a technology park near Moscow, and unveiled designs for a new business district in Prague.